The oldest Indian restaurant in Sheffield is featured in a new recipe book focusing on the cuisine. From Bombay to Britain, produced by Kingfisher Beer. features recipes from 50 handpicked restaurants around the country. Hop Hideout beer shop and tasting room on Abbeydale Road is celebrating its fifth birthday. The team has taken inspiration from an idol, Bill Murray, to hold a ‘Happy Murray Birthday’ from November 9-11. There will be five birthday collaborations from friends and breweries across the UK, Cards Against Humanity championshops and a themed fancy dress party. Bottomless brunches have been launched at Sheffield pub The Devonshire, on Division Street, at weekends. Diners can have unlimited mimosas or Bloody Marys, as well as hot drinks, with their food. Vegan and gluten free beers will be the stars behind the bar at The Riverside on Mowbray Street tomorrow, Friday November 2. The first First Chop takeover starts at 7pm with 7 cask and 3 keg lines on rotation. 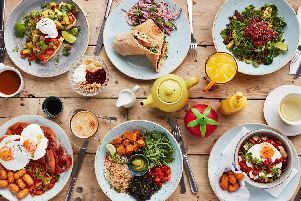 And talking of vegans, a plant based afternoon tea has been launched at Vine Hotels venues in Sheffield including Kenwood Hall. They will be available between November 10-18.